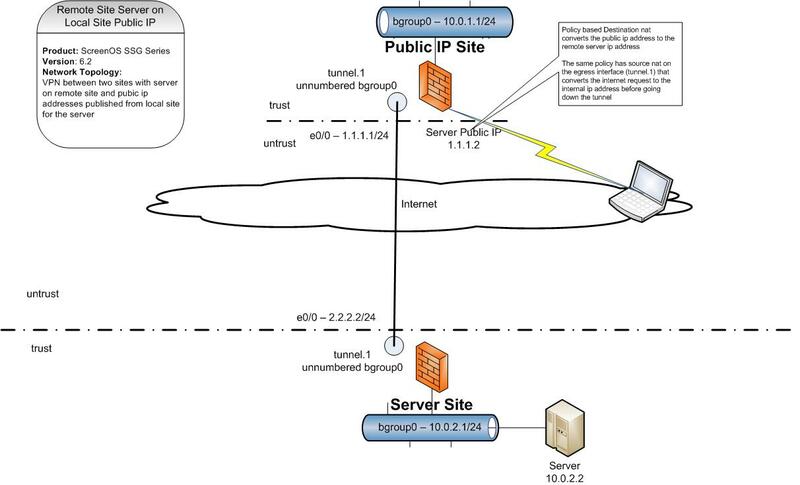 Two sites are connected via a route based VPN, server site and public IP site. The local public ip site publishes a policy to allow internet access to the server. Traffic is forwarded down the vpn tunnel and the responses returned to the internet requester. The sites have IPSEC VPN in route mode on unnumbered interfaces associated with the local lan ip segment. This allows the inbound internet traffic to also have source address NAT using this egress tunnel interface. Thus the return route for the internet request will be a local site address known to the remote site routing. 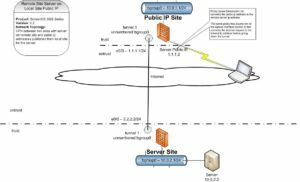 The process utilizes IPSEC VPN in route mode and NAT. This zone layout puts all sites and tunnels into the same security zone. No policies need to be created on any device for full communications across the entire hub and spoke network. This is assuming that intra zone blocking is NOT enabled on any of the firewalls for the trust zone. This is the default behavior for the trust zone. You can change the zone of the tunnel interface to untrust and create policies as needed to allow traffic. But changing the association of the tunnel interface off of the internal lan bgroup0 will necessitate changes in the source nat policy. The source address in nat must be known to the remote server site. You will need to create a dip with a local lan ip address to use for the source nat. Create the tunnel.1 interface on each site as unnumbered and associated with bgroup0. This is the same on both sites. Enable the proxy arp for destination nat. This is a CLI only command. Attempt server access and open the policy log. Verify that both the source and destination translation are occurring as expected.